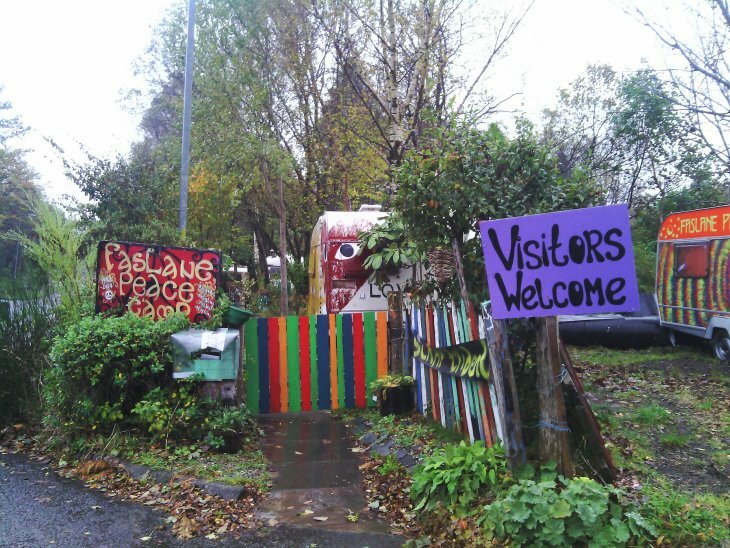 Founded in 1982, Faslane Peace Camp in Scotland clams to be the longest lived of its kind. Crammed into a small roadside verge, the brightly coloured and ramshackle caravans of the camp are located just a few hundred yards from the razor-wire fences of Her Majesty’s Naval Base Clyde, home to the British Trident nuclear weapons system. I argue in a recent article that the anti-nuclear activists who live at the camp expose the reproduction of nuclear weapons in everyday life – and point to how we might think and do security differently. These days, nuclear weapons are often in the headlines. At first glance, the UK parliamentary debates on the renewal of the Trident system, the gilded halls in which the international nuclear weapons ban was negotiated, or the media circus of the Korean nuclear summit seem far removed from the local spaces and mundane routines of ‘the everyday’. Accordingly, nuclear politics has been barely touched by the recent wave of critical scholarship on ‘everyday security’. Nonetheless, pioneering feminists like Carol Cohn and Cynthia Enloe have long pointed out how nuclear weapons are both maintained and contested in everyday life, in part through gendered performances, labour, and symbolism. Following this line of analysis, and borrowing also from Cristina Rowley and Jutta Weldes, I conceive of the campers at Faslane as ‘everyday security practitioners’, attempting to do security differently by reconstructing gender identity, domestic space, and care work – in public view and in juxtaposition to the base. So what can we learn about everyday nuclear (in)security from the Faslane Peace Campers? The dominant notion of nuclear deterrence assumes that insecurity is caused by external threats and by uncertainty, and that security is achieved through state possession of nuclear technologies that ensure rational enemies will decide it is not in their interests to attack. In contrast, campers see nuclear weapons as a key source of insecurity, particularly to the everyday lives of people living in close proximity to them. Campers also blur the boundaries between ‘us’ and ‘them’, and accept the inevitability of a degree of uncertainty in daily life. They pursue greater security by actively confronting the everyday reproduction of nuclear weapons, both through direct action against the adjacent base and through information-gathering and educational activities. Moreover, they strive to create an alternative everyday in the camp, one which is not only more secure but more liberatory, by being gender-equal, collectively organised and ecologically sustainable. Campers also blur the boundaries between ‘us’ and ‘them’, and accept the inevitability of a degree of uncertainty in daily life. We should not idealise the camp. My research participants were up-front about the frustrations and challenges of everyday life on site, and of their long and as-yet unsuccessful struggle to remove Trident from Faslane. It remains difficult to sustain numbers, leading to periodic concerns that the camp may have to close. Yet it would be wrong to dismiss the significance of the camp. After all, campers have repeatedly disrupted the daily routines of the nuclear state; they have also provided infrastructure for the wider Scottish opposition to nuclear weapons, as well as a resonant symbol of that opposition. The reconstruction of gender, domestic space and domestic labour at the camp plays a crucial role in all this. As demonstrated by protests at the Undersea Defence Technology conference in Glasgow in June of this year, the ‘Generation Y’ Youth Peace academy in July, and the Nae Nukes international rally in September, opposition to nuclear weapons in Scotland is not going away any time soon. Scholars of ‘everyday security’ would thus do well to pay more attention to ‘everyday security practitioners’ like those at Faslane Peace Camp, and to their distinctive challenge to the nuclear state and deterrence doctrine.